CHAUTAUQUA — This world became a somewhat darker place on June 29, 2018, with the passing of Geraldine Wright “Jerry” Mattocks of Winfield, Pa., and Chautauqua, with her smile that could light up a room. Jerry was born on March 18, 1927, to Donald E. and Madeline Bailey Wright in Jamestown. She was raised and attended school in Celoron, and graduated as an honor society member of Celoron High School Class of 1945. In 1949, she married Menzo Mattocks, who predeceased her in 1988 after 39 years of marriage. In addition to her strong efforts for her home and family, Jerry, a hard worker for most of her life, was employed in Jamestown’s Bigelow’s Department Store, Jamestown Mutual Insurance Company and most notably in Bucknell University’s Bertrand Library, from which she retired in 1994 after over 20 years of service. Jerry was very active and skilled at baking, sewing, ceramics and knitting. The world is filled with the many Christmas stockings she knit for others, over the years. She also enjoyed reading, doing word search puzzles, traveling and collecting dolls and teddy bears. She amassed an amazing collection of teddy bears of all sizes and styles. But most importantly, Jerry was a physically, mentally and emotionally strong person who was always looking for ways to contribute to her family, friends and the world around her. Whenever there was something to be done, she was always one of the first to roll up her sleeves and dig in. She considered no job worth doing to be beneath her. And she did all of this with a smile and song. But in addition to her industry, those who would listen, or learned to listen, discovered that she possessed amazing wisdom and problem solving skills, abilities that would dwarf those of many of the rich, powerful or otherwise influential in our world today. We need more people like she was. Jerry is survived by a now heartbroken son, Timothy Mattocks, with whom she lived, laughed, and traveled; a son, Michael (Sandra) Mattocks of New Berlin, Pa.; a daughter, Mary (Michael) Godfrey of Export, Pa.; grandchildren: Ryan (Colleen) Mattocks, Kara (Rodney) Larson, Deirdre (Steven) Bertotti and Sean Godfrey; great-grandchildren: Audrey Mattocks and Vincenzo Bertotti and Evelynn Marie Larson on the way; a brother, Richard (Susan) Wright of Jamestown; a sister, Donna (late Charles) Nelson of Lakewood; and numerous nieces, nephews, cousins, and friends. In addition to her parents and husband, she was predeceased by an infant sister. Friends will be received from 5-8 p.m., on Friday at the Freay Funeral Home, 139 S. Erie St., Mayville. 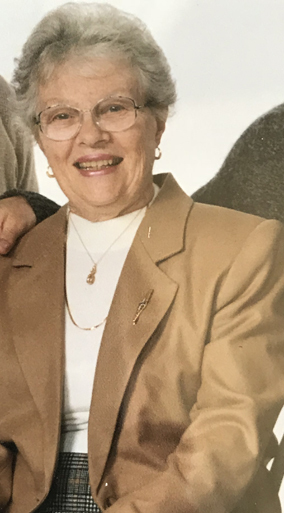 On Saturday at 11 a.m., a funeral service will be held at the Bemus Point United Methodist Church, 4954 Bemus-Ellery Road, Bemus Point, NY 14712, followed by a graveside interment service at the Bemus Point cemetery. Pastors Bill and Kristen Allen will officiate. A luncheon will follow at the church. Memorial contributions can be made to the United Methodist House, P.O. Box 115, Chautauqua, NY, 14722, or the Bemus Point United Methodist Church. Visit www.freayfuneral home.com for more information.